Auction: On Site, Tuesday 2nd September 2014 at 6.30pm. Nestled in its own bush reserve listen to the tuis and watch the wood pigeons and parrots from your wrap around deck. This four bedroom, three bathroom cedar family home must be seen to be believed - from the treetop master bedroom suite with its own balcony, ensuite, library and shoe room to the self contained extensive rumpus/bedroom with its own entrance, this place is unique! 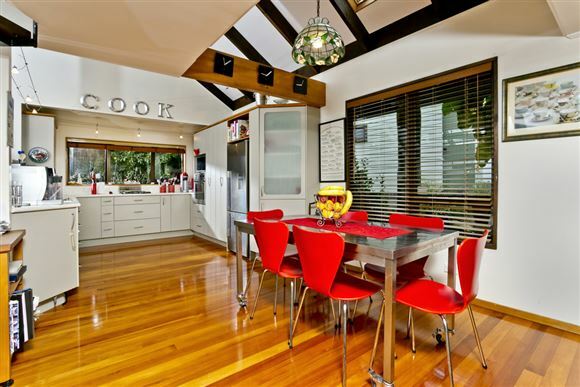 Cook's kitchen and modern bathrooms, large garage and extra parking included. The current owners are relocating to Wellington for new job and family commitments and reluctantly leave this private idyll. Wake up to birdsong in this paradise in suburbia.